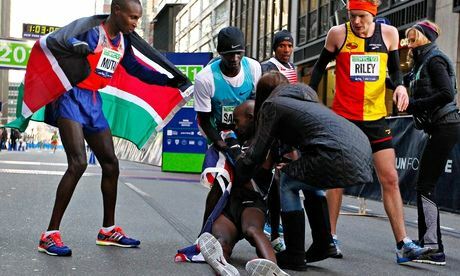 And, though banged up on his right knee and shoulder, and “seeing stars”, Mo rallied nicely over the final seven miles (12km) to run down Sambu in the final mile (2km) to take second place just 17-seconds behind the victorious Mutai (60:50). But to my eye the fall didn’t affect the probable outcome, nor the prospects for April 13th. I still think Geoffrey Mutai would have won yesterday’s race, and that Mo will find his transition from track champion to marathon star more difficult than some might expect. There is a very nice article in this month’s Running Times by Matthew McCue about running form, and how Coach Alberto Salazar is trying to alter Mo’s to fit with the requirements of the marathon. If anyone knows the importance of form it’s Alberto, whose own tightly pinched, low-rider stride in some ways was a career-shortener for the University of Oregon grad who won his debut marathon in New York City in 1980 in what was then the American debut record 2:09:41 (broken in 2007 London by Ryan Hall in 2:08:24). Yesterday, as the motorcycle camera came up alongside Mo as he raced down the West Side Highway past mile 10 (17km) it captured the three-time World Champion in full flight as he bore down trying to catch Sambu. What struck me as I commentated to an international TV audience was the long, slow-cadenced stride and full arm-release action Mo used to string the roadway beneath him. When the director cut back to Mutai up front, it was not lost on the practiced eye how compact and efficient was the world’s fastest marathoner’s form by comparison. 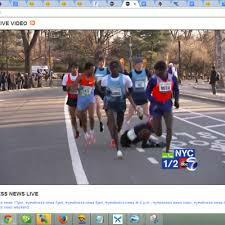 All Mutai’s action was from the waist down, as if his upper body was floating atop a smoothly operating pinwheel. You could draw a box around his head and a line across his hips, and even at 4:30 per mile pace (2:47/km) he wouldn’t have deviated outside those narrow confines. Sade sang about Mutai years ago; he is one Smooth Operator. Unfortunately, this same elegance presents one of the difficulties in showcasing distance running to the average sports fan. So efficient are the great marathoners of the world that watching what they do doesn’t compare to the propulsive dynamics exhibited by Lebron James or Blake Griffin as they perform windmill dunks from the foul-line in basketball. Asics has created a nifty treadmill harness that allows average runners to attempt running Ryan Hall’s American Record pace in the marathon (4:47/mile — 2:57/km) for as long as they can. The results are always surprisingly short. It doesn’t look hard when Ryan, Mo or Goeffrey does it; only when we try does the reality of the effort reveal itself. But in comparing Mo with Mutai one is once again reminded that the marathon is a game of fuel management in a way that 5000 & 10,000 meter track racing, and even 21,100 meter half-marathon racing is not. I recall a conversation I had many years ago with Haile Gebrselassie’s coach Dr. Wolde–Meskel Kostre as Haile was doing a track workout at Addis Ababa’s National Stadium in early 2000, two years before his marathon debut in London 2002. In that talk Dr. Wolde-Meskel said that while he fully expected Haile to become a great marathon runner, first he had to transform a sports car to a rally car, because a sports car — track runner — was far too profligate a spender of fuel — consumer of oxygen — to perform functionally over the marathon distance. As Haile would learn after his third-place finish behind Khalid Khannouchi and Paul Tergat at the 2002 London Marathon, there was a clear distinction between 10,000 meter track racing and 42,000 meter marathon racing. Recall, too, that it took track and cross country champion Paul Tergat six attempts before he won his first marathon. 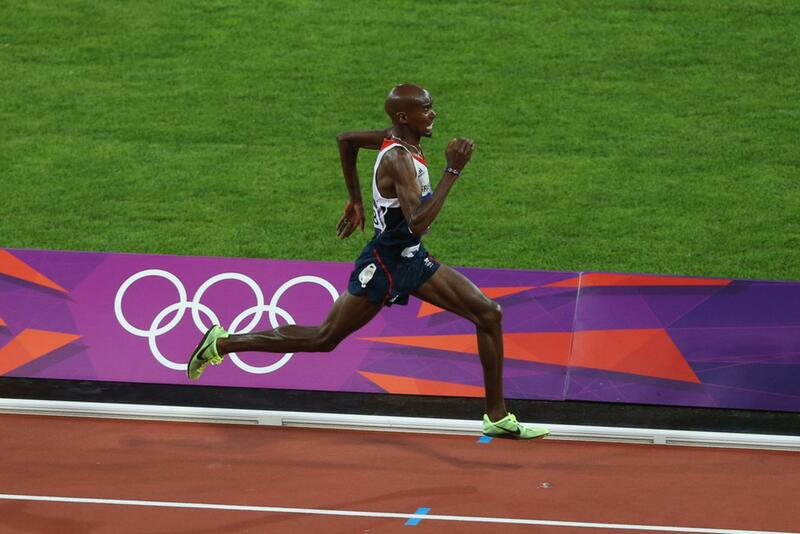 Word before yesterday’s race was that Mo had dropped about four pounds in body weight – down to 118 lbs.now — as he increased his mileage during his three month stint in Iten, Kenya in preparation for London. Alberto acknowledged on Saturday that Mo’s total mileage per week had gone up from a previous high of 120 to an average of 130-140. Last year Mo famously joined the lead pack at the London Marathon for a dry run for this year’s full-distance attempt. One of the lessons he took from that experience was the need to learn how to rehydrate at race pace, something that track racing doesn’t require. 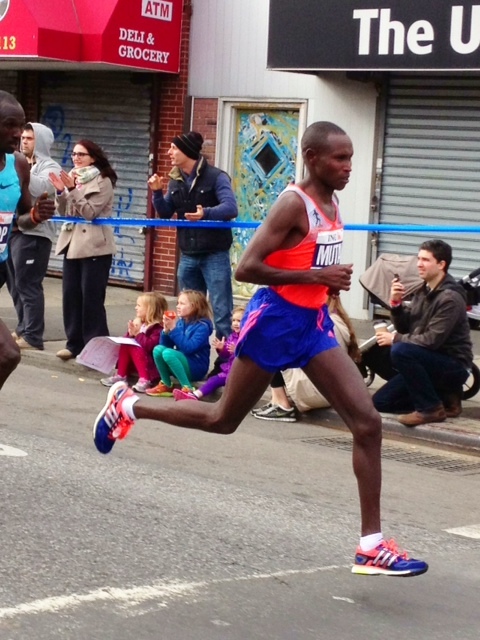 In the end, yesterday’s New York City Half-Marathon created more questions than it answered as both Mutai and Mo return to their respective camps in Kenya for their final month of training before meeting once again in the big London showdown. There Mo will meet a few more non-Joe Blows – world record Wilson Kipsang, Olympic champion Stephen Kiprotich, London record holder Emmanuel Mutai, and defending champion Tsegay Kebede — as he attempts to put the world in a fainting swoon of its own. Taking a look orward to peer you.